Have you ever wondered what it would be like to have your name on the front of a steam engine? 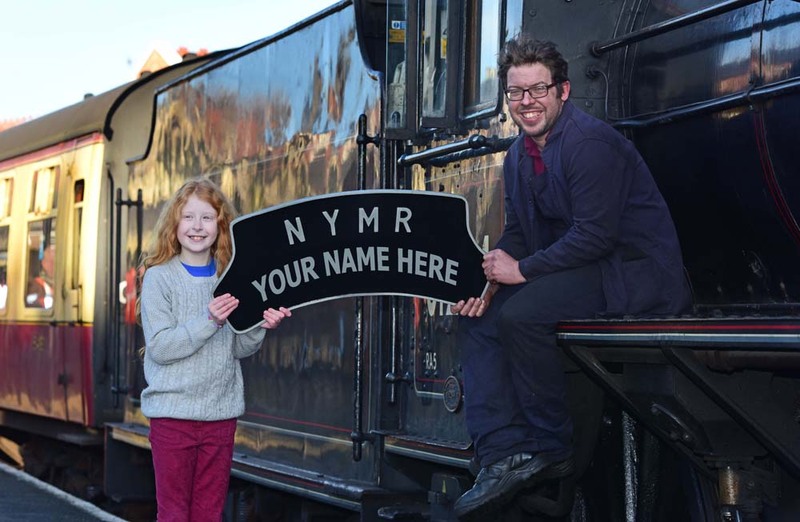 This February half term, 18th to 26th February, the North Yorkshire Moors Railway (NYMR) is giving its younger passengers the chance to have their name on a headboard on the front of a steam locomotive. All children visiting the NYMR over the holiday, aged 4 to 15 years old, will be given the chance to enter for this one-off exclusive opportunity. The winning entrant will be able to see their name on the front of a steam locomotive over the Easter weekend and get to keep the headboard as a unique souvenir! This half term visitors will have the opportunity to explore the railway’s four stations and travel along the 18-mile railway line aboard steam and heritage diesel trains. At Pickering station, visitors can explore the 1930s station and visit Peter’s Railway Young Engineer’s Centre, an interactive exhibition for children to learn about engineering and science through storytelling. Levisham station is great location for letting off steam with the many scenic walks in the North York Moors National Park. At Goathland visitors can explore the celebrity station which became Hogsmeade station in the first Harry Potter film and visit the converted 1922 style goods shed tearoom. Meanwhile at Grosmont station visitors will have the chance to explore the engine sheds where our steam and diesel locomotives are maintained and restored. In 2017 the railway celebrates 50 years since the formation of the NYMR Preservation Society, forerunner of the current Charitable Trust (1967 – 2017). Today the railway is a not-for profit charitable organisation run as part of the local community. Day to day operation is carried out by volunteers who focus on improving the quality of the infrastructure, the railway vehicles and passenger experience. Next Topic: Bluetooth-Controlled Model Trains Will Completely Revitalize the Hobby, If We Are Smart Enough to Let Them.